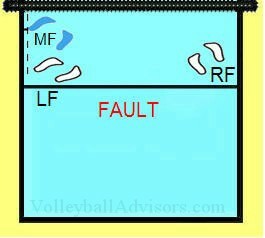 Explore easy to understand volleyball court positions information. 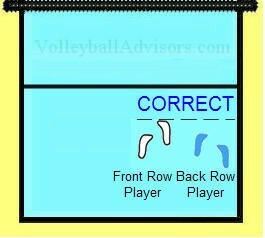 You'll find simple information how to line up players on the volleyball court. To keep things simple, imagine there a pair for each player on the court - players form "couples". position 5 player (left back, LB). 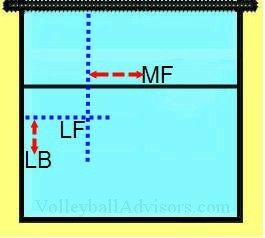 How to measure volleyball court positions between two players? Location of the players is measured by the sideline or centerline. Some part of the body (usually foot) has to touch the ground closer than couple's part of the body. 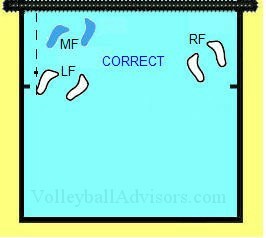 In the following picture you’ll see those couples in the serve receive line up. 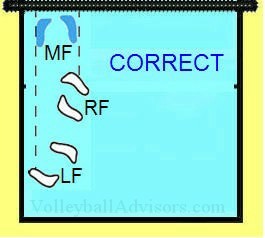 As you can see both of those requirements are filled, therefore this serve receive lineup is legal. 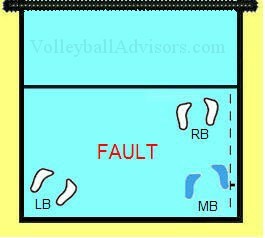 Correct or Fault Volleyball Positions? The following pictures show you how those “couples” should locate themselves to the court. If line up is legal the picture states “correct”. If there is something illegal, picture states “fault”. Fault. 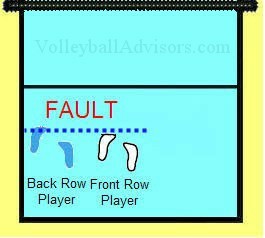 The reason why: front row player is not in front of the back row player. They are side to side – front row player needs to be ahead. Fault. 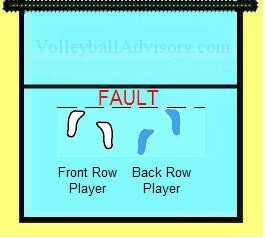 The reason why: Back Row player is in front of the Front Row Player. Correct. Front row player is correctly placed. The reason why: Front Row player is in front of Back Row player. Correct. The reason why: Left Front player is placed on the left side of the Middle Front player – and Right Front player is placed on the right side of the Middle Front player. Correct. For the same reason than in the previous picture. The reason why: Left Front player is placed on the left side of the Middle Front player – and Right Front player is placed on the right side of the Middle Front player. Fault. 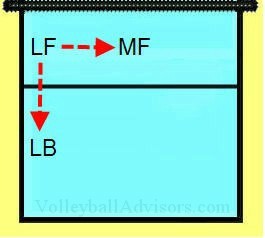 The reason why: Left Front player needs to be on the left side of the Middle Front player. Fault. The reason why: Right Back player needs to be on the right side of the Middle Back Player.